The sign in page now gives you the ability to configure the background and title along with a customized image. Now it's time to get started on designing your very own customized sign in page! The system announcement function allows administrators to post or schedule announcements. This replaces the system administrator having to notify users via emails or text messages and can help to quickly get the word out about any important information. 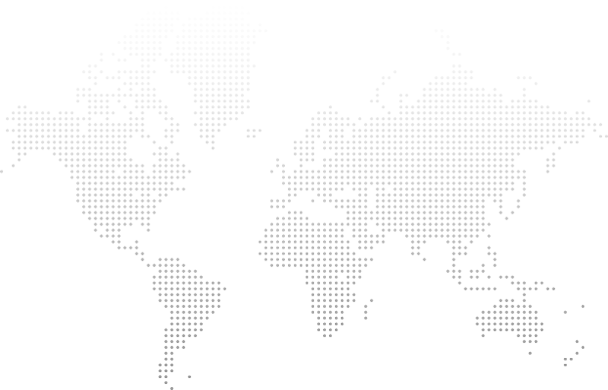 Announcements can be configured to be displayed before, after or during log in. Businesses can use this function to announce backup times, system maintenance times or other important events to employees while regular users can use the function to inform family and friends about any newly uploaded photos or videos that they wish to share. 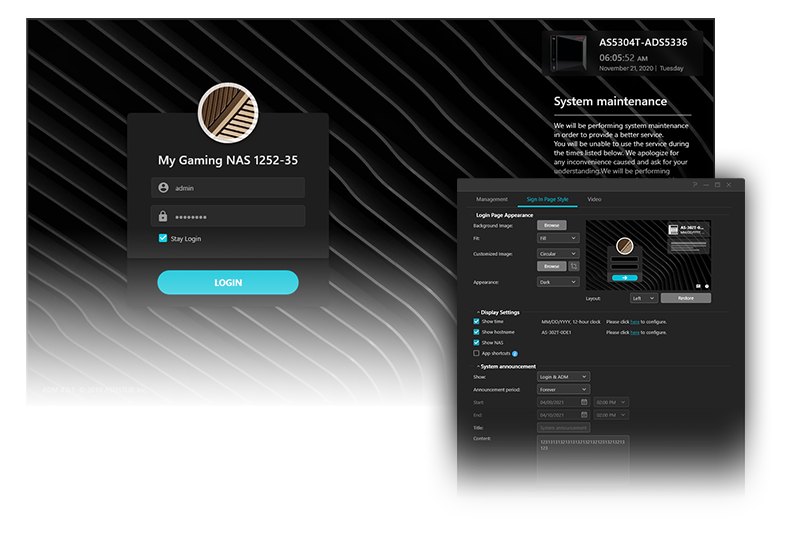 In order to help users quickly get started with ASUSTOR NAS, ADM 3.0 provides an online help assistant before and after logging in to the system. 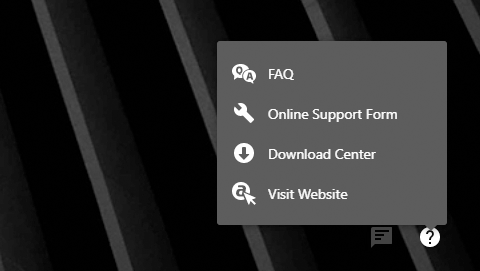 The inquiry icon in the upper right-hand corner of the interface helps users access FAQ, technical support, download center and the official ASUSTOR website for even more information. After logging in to ADM the Online Help information guides users by providing information for ADM core functions and links to forums, downloads, compatibility tables, tutorials and technical support. 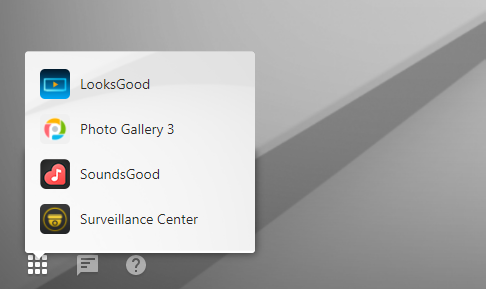 ASUSTOR has simplified the Photo Gallery, SoundsGood, LooksGood and Surveillance Center login process by adding a new shortcut option. Users only need to install these four Apps and then select the shortcut option under the settings menu and they will be able to pin these Apps into the upper-right corner of the ADM login screen. 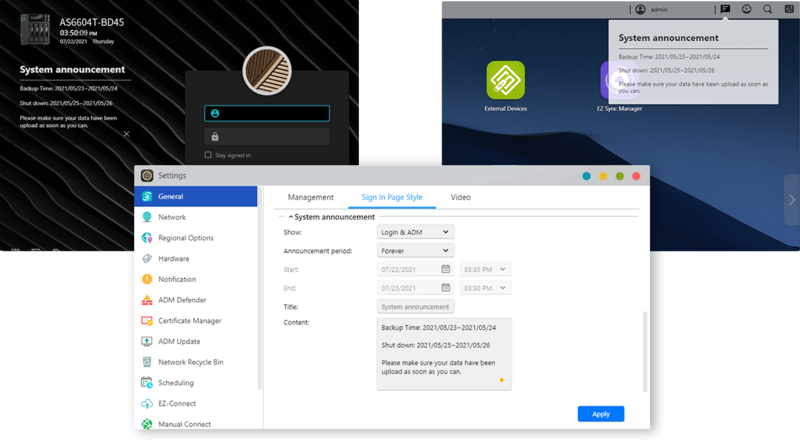 This allows users to skip over the ADM login process and quickly access the dedicated page for the App they want to access, login there and then begin to use the App.